Skipp asked us all to wait until he made the official announcement. Wednesday, he made the official announcement, SO HERE IT IS! 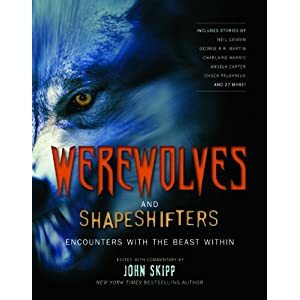 I can finally announce the TOC for WEREWOLVES AND SHAPESHIFTERS: ENCOUNTERS WITH THE BEAST WITHIN, which Black Dog and Leventhal will be releasing in late September. 35 stories, 18 of them original (including the Bentley Little), in 640 pages, with essays by yours truly and informative appendices on shapeshifting history and popular culture. A zesty blend of big shots and unknowns, including four authors who had never published fiction before. Plus lots and lots of amazing stories by women, for those who keep track of such things. I love this book. You heard it here first! This entry was written by Princess Alethea and posted on June 18, 2010 at 11:44 am and filed under Short Stories, writing. Bookmark the permalink. Follow any comments here with the RSS feed for this post.